Group tickets are a great way to fill up your events by allowing bookers to bring along their friends or relatives, sometimes with the incentive of a discount. It's really easy to set up a Group ticket in the Tickets & costs section when creating or editing an entry. Simply create a ticket as normal (click on add another ticket type if you already have a ticket created and wish to create an additional option), entering a ticket name, additional information etc. When entering the cost of booking bear in mind that this is the full amount you will receive (before any payment gateway fees) for all the attendees on this ticket, so make sure it is an acceptable amount for you! You may also wish to include a slight discount on the purchase price of the individual tickets as an incentive to buy. Also consider the number of tickets available and how this corresponds to the maximum event size. For instance, if your event is set to only allow 6 attendees, you will only be able to sell 1 Group ticket that allows entrance for 4 people. 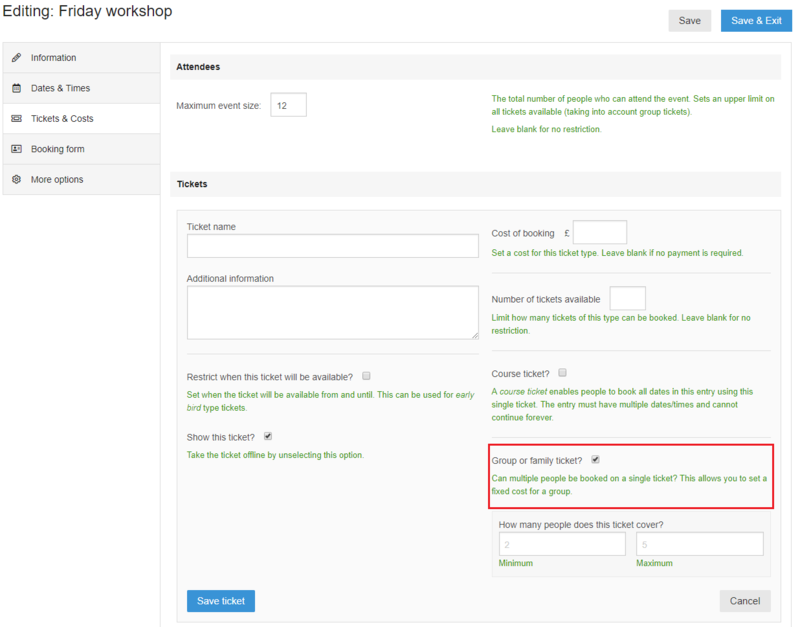 To make a ticket into a Group ticket just click on the checkbox next to Group or family ticket. You will be asked how many people does this ticket cover? and given fields to enter a minimum and maximum number of attendees - if you want the ticket to cover only a certain amount of people (e.g. just 4 people, no more, no less) then enter the same number in each box.